Distributor: Running Press Book Publishers, of Philadelphia, Pa. Hazard: The mini fireplace which houses the candle can ignite, posing a fire hazard. Incidents/Injuries: Running Press has received two reports of incidents involving the fireplace igniting. No injuries or property damage have been reported. 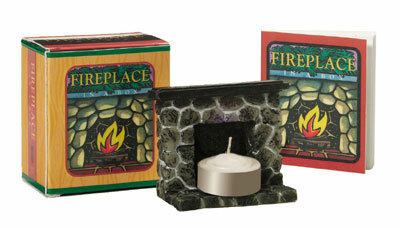 Description: The recalled Fireplace in a Box kit includes a 2.5-inch high by 2.5-inch wide plastic fireplace that resembles stone masonry with a black mantle, a tea light candle to fit inside the fireplace, and a small booklet “Fireplace in a Box.” “Fireplace in a Box,” “Mega Mini Kits,” and “ISBN 0-7624-1603-3” is printed on the fireplace’s packaging. Sold at: Chain and independent booksellers nationwide from September 2003 through April 2006 for about $8. Remedy: Consumers should stop using this recalled product immediately and return it for a full refund to the place of purchase, or directly to: Running Press, 2300 Chestnut Street, Suite 200, Philadelphia, Pa. 19103, Attn: Fireplace in a Box Safety Recall. Consumers returning the product to Running Press directly must include full names and addresses and can expect to receive a check within four to six weeks. Distributors: Hoshino USA Inc., of Bensalem, Pa. and Chesbro Music Company, of Idaho Falls, Idaho. Hazard: If the battery is improperly installed, the bass can overheat causing internal damage and a fire hazard. Incidents/Injuries: The firm has received three reports of the bass not working due to improper battery installation. There have been no reports of injuries or property damage. Sold at: Authorized Ibanez dealers nationwide from March 2005 through March 2006 for between $700 and $1,400. Remedy: Consumers should stop using the basses immediately and contact their local Ibanez dealer for a free inspection and repair. Dealers will remedy the hazard by having affected basses updated with a new battery snap connector. Distributor: Masterfoods USA, of Hackettstown, N.J. Hazard: If a candle burns all the way down, the plastic Menorah could ignite and present a fire hazard. Incidents/Injuries: Masterfoods USA has received five reports of the Menorah smoldering or igniting. No injuries or property damage have been reported. Description: The recalled Menorah is an eight-branch candleholder designed to resemble M&M’S® Brand candies. On each end of the Menorah is an M&M’S® Brand character holding a Star of David. Sold at: M&M’S World® catalogue, M&M’S World® stores in Las Vegas and Orlando, and online at www.mmsworld.com from November 2005 through December 2005 for about $30. Remedy: Consumers should stop using these Menorahs immediately and return them to Masterfoods USA for a full refund including taxes and shipping and handling, where applicable. Masterfoods USA is also offering a $10 gift certificate good towards the purchase of any M&M’S® collectible.